Observation - Common Spotted-orchid - UK and Ireland. 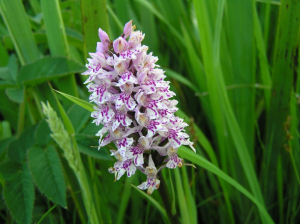 Description: A spotted orchid assumed to be common spotted even though growing in acidic soil area, bt on ground above the marshy grass. A spotted orchid assumed to be common spotted even though growing in acidic soil area, bt on ground above the marshy grass.